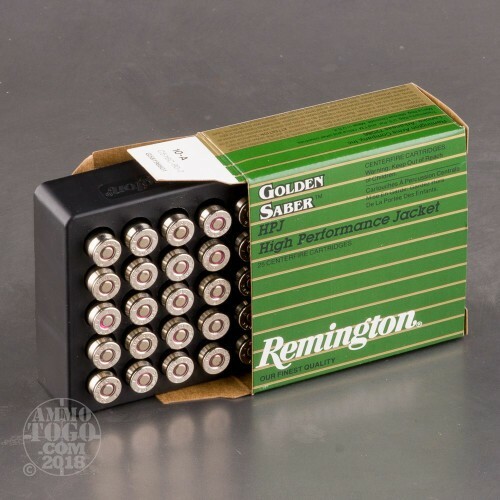 A 500 round bulk pack of .380 Auto rounds from Remington's Golden Saber line is a great way to stock up for carry and high fidelity training with your favorite pocket pistol! 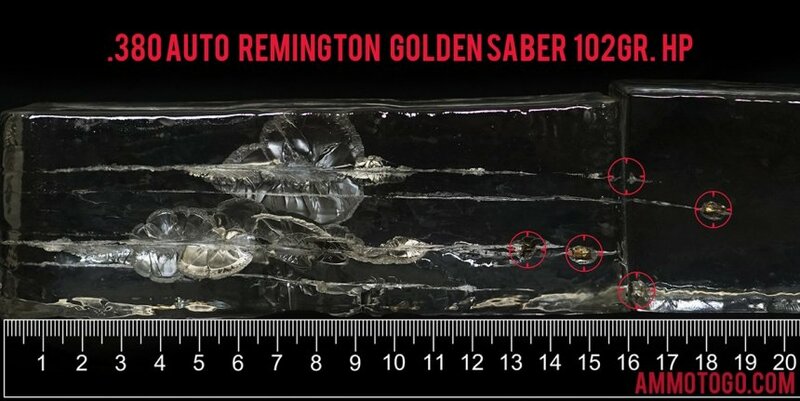 Golden Sabers are one of the most recognized lines of self-defense ammo and undergo constant revision as cartridge technology evolves. These rounds are built using brass casings which have been nickel-plated for easy identification, corrosion resistance, and seamless feeding and ejection. Each casing is equipped with a reliable Boxer primer and topped with a Golden Saber jacketed hollow-point (JHP) projectile. This particular JHP possesses a wide mouth, shallow cavity and uniquely designed spiral skiving which all contribute to wide expansion upon impact with large petals that create a threat-stopping wound cavity. 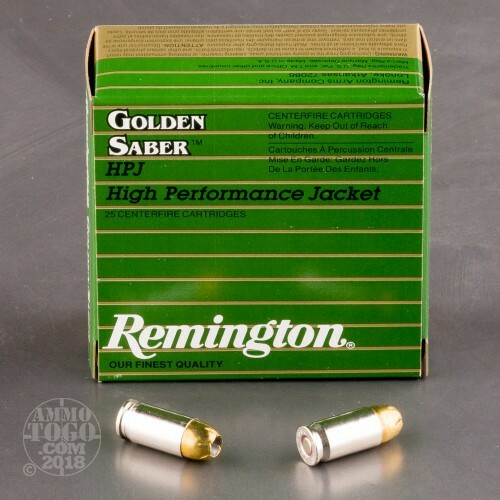 In addition, Golden Saber bullets use a brass jacket for increased hardness which helps retain weight and control the rate of expansion for more focused energy distribution in a target. The 102 grain bullet is made heavier than standard .380 ACP weight for smoother recoil impulse, increased momentum, and deeper penetration. Remington is one the oldest and most well-recognized firearms and ammunition manufacturers in the United States. With over 200 years of experience in mass production, military supply, and product innovation, Remington is sure to meet your demanding standards for personal defense rounds with high quality and consistent performance. As you hunt for the best self-defense 380 Auto (ACP) ammo, we thought you might enjoy seeing the results of some testing we recently conducted with calibrated Clear Ballistics gelatin. We shot five of these Remington Ammunition rounds through a four-layer cloth barrier using a Ruger LCPII. The results are detailed in the video you see above as well as the photographs. Through the charts, you should get a great idea how this Remington Ammunition ammo stacked up relative to other 380 Auto (ACP) ammo products available to American shooters. 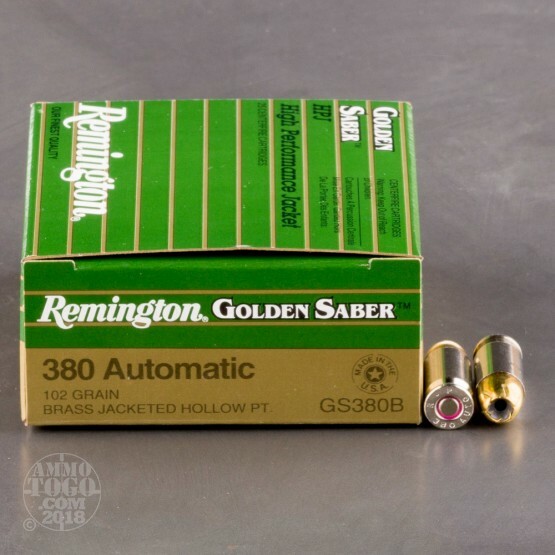 How do the results for this Remington Ammunition 380 Auto (ACP) compare to other 380 AUTO? Expansion Diameter Compared to All 380 Auto (ACP) Ammo Tested MIN 0.35" MEDIAN 0.355" THIS AMMO 0.35" U.S. dime MAX 0.78"
Penetration Depth Compared to 380 Auto (ACP) Tested 0" 10" 20" 30" MIN 6.5" MEDIAN 13.3" THIS AMMO 16.3" MAX 28.7"
Here's a look at some of the most common questions our fellow shooters have about 380 ACP ammo. What Does “ACP” Stand For? “ACP” is a designation given to many different cartridges. Standing for “Automatic Colt Pistol,” this moniker is used by cartridges that were created by Colt’s Manufacturing Company, more commonly known simply as “Colt.” The cartridges, including the .25 ACP, .32 ACP, and .45 ACP, are all made specifically for Colt firearms. For marketing purposes, companies want their name on ammunition, so while the .38 ACP was created by the famous designer John Browning, he was working for Colt at the time so it took the “ACP” surname. Are the .380 ACP and .38 Special Interchangeable? There is a chance you would be able to fit the .380 ACP in a firearm made to fire .38 Special, but we definitely don't recommend it. These cartridges have slightly different dimensions for both bullet and neck diameter (the .38 Special is slightly wider), and the overall length is significant, as the .38 Special is over a half-inch longer. Also, the .380 ACP is designed for pistols, while the .38 Special is generally a revolver cartridge. Why is the .380 ACP Less Common than Cartridges Like the .38 Special and 9mm Luger? The .380 ACP is certainly not a exotic cartridge, but you are less likely to find it at the range than the .38 Special and 9mm Luger. There may be many reasons for this, but it really comes down to power. The .380 ACP rarely has muzzle energy over 215 foot-pounds unless it is “+P,” a high-pressure, cartridge. The .38 Special often exceeds 250 foot pounds, while the 9mm Luger is usually well above 300 foot-pounds. Is the .380 ACP Reliable for Self Defense? Yes. Despite the smaller stats, the .380 ACP is certainly capable of stopping a threat. In fact, many concealed-carry enthusiasts appreciate the small, compact nature of the .380 ACP, claiming it allows for convenient, discreet firearms that still carry a reliable number of rounds. If choosing rounds for self defense, look for expanding bullets such as jacketed hollow points. You might take a look at our 380 ACP gel test results below to get an idea of how each round performs relative to others under identical circumstances. Why is .380 ACP More Expensive, Despite a Smaller Size? 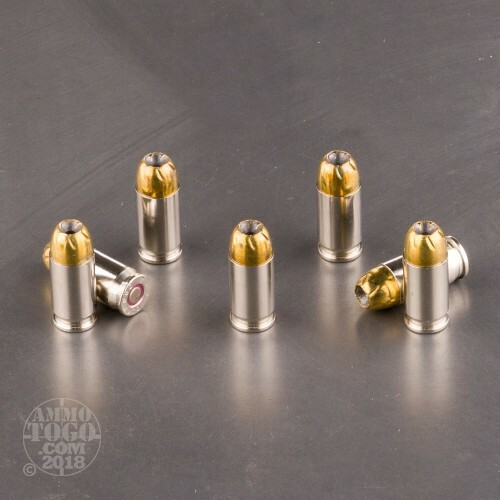 If you compare the .380 ACP to other cartridges such as the 9mm Luger or .38 Special, you will often find that it is slightly more expensive, or at the very least the same price as these rounds despite having a smaller profile. Generally, smaller rounds, which require less material, are cheaper, but because other rounds are often produced at higher volumes, manufacturers (and hence distributors) can charge less for the cartridge. Many militaries across the world use 9x19 ammo in duty - so there's a ton of it produced annually all over the world. This is why you may find comparable .380 ACPs are as much as $.05 more per round than, say, the 9mm Luger.